Minor League Baseball released its pace-of-play rules and regulations for 2018, adopting level-specific mound visit limits and a tie breaker procedure for extra innings. Unlike MLB, MiLB will continue its pitch clock usage throughout the upcoming season, with modifications to timing and situational procedures. The minors have introduced new timing rules. MiLB also announced that players will have 15 days to adjust to the new pitch timer rules, instructing umpires to issue warnings in lieu of automatic balls and strikes through April 19. 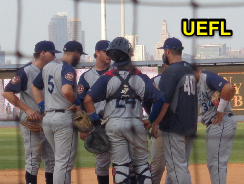 Starting April 20, the 16th day of the minor league season, umpires will enforce the rules as written and call automatic balls or strikes as specified. Extra Inning Tie-Breaker: A rule already in existence at the lowest levels of professional baseball in the Arizona and Gulf Coast Leagues, all classifications across MiLB will now begin every extra inning with a runner at second base. This means that the top of the 10th inning of a tied ballgame will begin with the player in the lineup preceding the leadoff batter at second base (e.g., if lineup position A7 leads off the 10th, then A6 will begin the inning on second base). As it relates to scoring (e.g., for calculating earned runs), this pre-placed runner will be considered to have reached base due to a fielding error, which is not charged to the defensive team nor any fielder. Related Post: MiLB to Test Extra-Inning Run Scoring Procedure (2/9/17). This rule is a modification of what existed during the 2017 World Baseball Classic, which placed runners at both first and second base to begin extra innings 11 and beyond. Related Post: 2017 World Baseball Classic Rules Mods Released (2/9/17). Mound visits are limited by level of play. Mound Visit Limit: Similar to its MLB counterparts, Triple-A clubs will encounter a six-visit limit. In Double-A, the limit is eight visits per team, while in Single-A, the limit grows to ten. There shall be no limit to mound visits in Short-Season and Rookie leagues. For more about what constitutes, and what isn't, a mound visit, refer to the following link. 15-Second Pitch Timer: Following a successful 2016 Arizona Fall League experiment, MiLB's existing 20-second pitch clock shall be reduced to 15 seconds with no runners on base. With runners, the clock shall remain at 20 seconds. 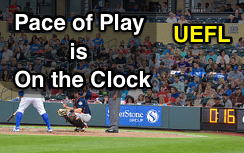 The Minor League Baseball pitch clock was first adopted in 2015, and set to 20 seconds for all game situations, following a 2014 AFL initiative that first introduced the 20-second timer. Related Post: MLB to Test Pace of Game Proposals at Arizona Fall League (10/1/14).Related Post: MiLB Double-A, Triple-A to Adopt 20-Second Pitch Clock (1/15/15). Diagram of when the MiLB timer shall start. 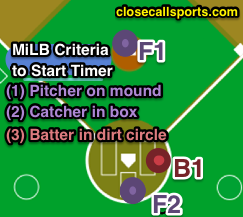 The 15 second clock will begin when all three of the following criteria are met: (1) the pitcher has possession of the ball and is standing on the dirt circle or pitcher's mound, (2) the catcher is in the catcher's box, and (3) the batter is in the dirt circle around home plate, whether or not the batter is actually in the batter's box. The clock will stop when the pitcher begins his windup or begins his motion to come set, and shall reset if the pitcher fakes a pick off or steps off the rubber with runners on base (in which case, the timer will restart immediately). Pitch Clock Penalties: If the batter is not in the batter's box and alert to the pitcher with seven seconds or less remaining on the timer, then an automatic strike will be awarded. Only if the batter is in the box and ready to hit, an automatic ball shall be called if the pitcher fails to begin his windup or motion to come set within the 15- or 20-second limit.